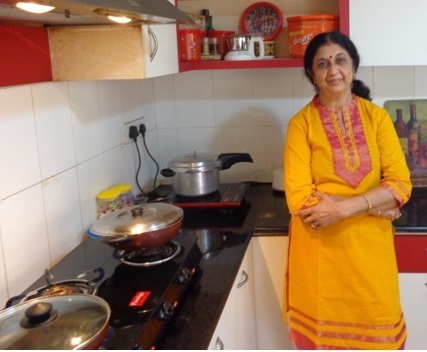 Shobana Rao describes herself as the quintessential home maker, but she’s a lot more than that, as you will see on her blog, Cooking with Shobana. A blog that features in the Top 100 Indian Food Blogs and Websites – sharing space with legends such as Tarla Dalal, Sanjeev Kapoor, Nisha Madhulika, and other tall hats in world of cookery and frontline cuisines. Cooking With Shobana was also on the list of The Top 74 Food Blogs with Delicious Recipes You Should Follow Today – written by Tiana Matson on her website, Yum of China. Shobana and her husband, Prem Rao, live in Bangalore and are at that enviable “empty nester” stage. They have two children and are now happy grandparents. So here we go, to find out more about those wonderful aromas coming out of her kitchen. When it comes to cooking, are you influenced by early exposure at home? My blog though, is wider in scope and perspective – you will find at present, over 600 recipes from varied cuisines, and from different parts of India. When did you take to cooking in a serious and inspired way? I became interested in cooking after I got married – aged 21, and had to run a house on my own. Come to think of it, there was no choice in any case (laughs). My husband and I lived alone and since he knew less about cooking than I did, guess who had to manage the kitchen? Those days there was no internet, and Google wasn’t even thought of, I guess. Newly married girls like me eagerly looked out for recipes from magazines such as Femina, and Woman’s Era – popular in those days. We used to cut out recipes and file them (sometimes, painstakingly copy them out to notebooks for future reference.) As the years went by, it was common to see our recipe scrap books with additional embellishments – friendly stains from spice powders, and later, doodles by our infant kids! Do you like to experiment with new cuisines, cooking styles, methods? That’s a multi-part question, but let me start by saying that I prefer to stay with the tried and tested. Within the broad gambit of Indian vegetarian cooking, I like to try out dishes from different parts of our vast country with its diverse cultures – but I haven’t really experimented going beyond this. In that sense, I am more conventional. For example, I am not likely to try out dishes way beyond my horizon such as Middle Eastern cuisines, or traditional European fare. When it comes to cooking methods, so much has changed over the years. Over time, gadgets have come to ease the manual element in our cooking – making it that much easier. For example, the microwave oven has become the popular idiot box of the kitchen – making things quicker and more efficient. Like many others, I too have started using the microwave to cook traditional Indian food with amazing results. When I first began cooking, we did not have many of the modern-day conveniences one takes for granted. We had to grind the batter for idli and dosa manually, using our time tested grinding stone. Likewise, spice powders needed to be pounded and powdered fresh – virtually from scratch, each time you started a cooking session. When did you start your blog, Cooking with Shobana? I took to blogging in March, 2013 – at a stage in my life when I had a little free time on hand. My husband had retired by then, and my children had gone to pursue their own careers My blog is my passion and since it is about cooking, the two are closely intertwined. The more I cook, the more I blog, so to speak. As far as I can recall, it started off as an album in my personal Facebook page called “I Love Cooking.” I began to share pictures of dishes that I had made and these were just images without any recipes. Friends who liked the album suggested I share recipes along with the pictures. As the name suggests, Cooking With Shobana is about sharing a collection of recipes, some cooking tips, and useful hints. 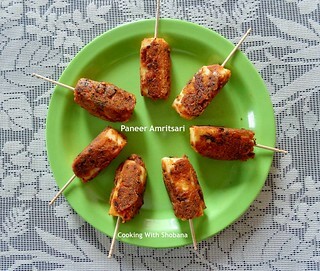 The recipes largely cover Indian vegetarian cuisine, and I love to share whatever I know or have learnt over the years. Looking at site visitors, I have logged 2.2 million page views or hits as of now. I hope it will cross the milestone of 25,00,000 or 2.5 million in the days to come! Who is your support system for the blog, in keeping it updated? My husband has always been a major source of inspiration and support. An author and blogger himself, Prem thought it would be useful to set up a blog for sharing, interactions and being visible in the big wide world. He took me through the entire setting up process, and got me up and running. He continues to be my partner in the blog and is my biggest supporter. I do all the cooking while he does the photography. I suggest the plating and presentation and we sort of do this and the content generation and uploading together. It is a team effort we are proud of. Are your recipe formats easy to cook with? Especially for young enthusiasts / couples trying their hand at cooking for the first time. I like to keep things simple. The objective is to help even a novice with a set of easy to understand instructions and guidelines. We don’t use fancy expressions preferring simple, basic kitchen terminology. I recognize that readers from all over the world may not be familiar with many of our terms, so I do take pains to add helpful comments wherever possible. I also think people (men and women, these days) would find my blog working like a companion guide. That’s why it is useful to see things from the reader’s point of view – in order to make the recipes easy to follow, right down to the final stage of serving the dish. One of the things about experienced cooks is the effortless / instinctive measuring of cooking ingredients, or estimation of cooking time – how does this happen? Like most people of my profile, I too started cooking using approximations. It was only when I started my blog that I began to measure out quantities for each ingredient – which is essential when you are documenting a step-by-step method. That was when I appreciated the value of precise measurements and their outcomes. Over time, it’s usually rule of thumb – and more often than not, these approximates come close to the recommended weights and measures. I guess a lot of this comes from experience. For example, seldom did my mother dwell on the quantities she used on each ingredient. Yet, by observing her, I got a good feel for portions and consistency – which I refined over time. What plans do you have for the future? Where do you go from here? I have no specific goals as such. I would like to continue the way I have been doing for the past few years. At this stage of my life, there is not much that I expect. I hope the blog has helped and will continue to help others. Many young ladies (including Indians settled in different parts of the world) have told me that they are reminded of their mom’s kitchens when they go through my blog and I find this very gratifying. I feel particularly pleased when young people these days (in India and abroad) mention that they use recipes from my blog very often – or that they consult my blog when they have some doubts. Some have gone so far as to say that they couldn’t have cooked without my blog. I guess they are being far too kind, but encouraging enough to sustain my interest in something I am really passionate about – cooking.